Hawthorn, a compact, deciduous tree, grows as either a shrub or a tree, to 15 feet; its trunk or stems have hard wood, smooth and ash-gray bark, and thorny branches. The small, shiny leaves are dark green on top, light bluish-green underneath, and have 3 irregularly toothed lobes. The frail white flowers, known as “may”, have 5 round petals and grow in terminal corymbs, spreading clusters, during May and June. In some varieties the blossoms may be pink or deep red. The fruit, or haw, is 2-3 seeded, egg-shaped, freshly pome, scarlet on the outside, yellowish and pulpy on the inside. The berries or fruit hang in small bunches from the thorny shrub, each berry has 1-5 seeds. Berries remain on the tree after the leaves fall off in autumn. 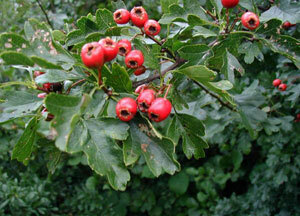 Beware of the sharp thorns when harvesting hawthorn, eye scratches from thorns can cause blindness. In medieval Europe, hawthorn had an entirely different image. Generally regarded as an unlucky plant, it was thought that bringing its branches inside would portend the death of one of the household’s members. Hawthorn was also one of the witch’s favorite plants and was especially to be avoided on Walpugis Night, when witches turned themselves into hawthorns. With a little superstitious imagination, the hawthorn’s writhing, thorny branches at night probably do look enough like a witch to have instilled fear in medieval folk. Take 1 capsule, up to 3 times a day.